As the celebrations mellowed (though for a fraction of seconds) at Mumbai’s Wankhede stadium soon after India completed an emphatic victory over a mediocre West Indies side, 'the God' jogged up to the 22-yard pitch to seek one last blessing before walking into the shadows forever. The moment moistened quite many eyes. Sachin Ramesh Tendulkar, their God, had a spring in his steps since he stepped foot on the ground for the third day’s play. But, as he walked off the field, even he couldn’t stop back his tears. “Ishant… bring back Ishant now…. ” the frantic plea from the Vijay Merchant stand from where I was witnessing history being scripted, kept coming through every time West Indies batsmen sought to break the shackles. That’s how desperate the crowd was to see Sachin bat again. The roar was anticipated; walking into the Wankhede Stadium in the morning pumped up the adrenaline. Chants of ‘Sachin… Sachin…’, ‘Thank You Sachin’ and Ganpati Bappa Morya, Pudhcha over Sachin la dya (Lord Ganpati, please give next over to Sachin) reverberated through the arena throughout the day. It seemed as though the remaining 12 (including the hapless Windies batsmen) players did not exist on the field. Every run from the Windies’ bat was cheered to no end. Many in the audience pleaded them to keep scoring and make India bat again. But besides the occasional display of class, the tourists refused to dig deep. All hell broke loose when Dhoni threw the ball to Sachin. Though he didn’t do wonders with the 12 right-arm spinners he bowled, the crowd wanted him to continue. That the main spinners -- Ravichandran Ashwin and Pragyan Ojha -- had polished off the visitors in under 50 overs, didn’t matter. They had just come to see the ‘little master’ one last time. 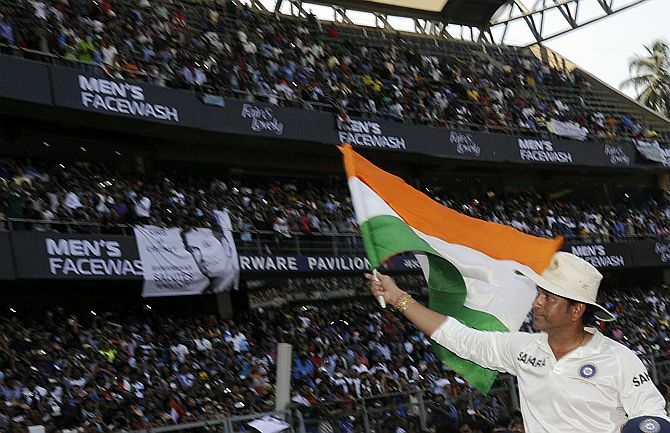 I have never identified myself as an ardent Sachin fan. In fact, I, like hundreds of Indians, have in the recent years played critic during his ‘stay’ at the crease. I refused to accept him in the 20-20 avatar of the game and slammed him for playing for personal gains and undermining his persona. But then, every time he stepped on to the field, I yearned for an innings like the 131-ball 143 against Australia in Sharjah. And my heart sunk whenever he got out cheap or conceded crucial runs off his bowling. Yet, his very presence in the Indian line-up was a morale booster; every time he stepped out of the dressing room to take guard, I cheered. And cheer I did again -- on one of the most memorable days of my life -- watching the legend lead his team out on the field, holding fort at square leg, while acknowledging the pleasantries from the stands behind and advising young pacer Shami Ahmed. The moment that the over 20,000 strong fans had been waiting for arrived when Shami uprooted Shannon Gabriel’s middle stump. Even as Sachin joined his team-mates in the celebrations, the crowd went ballistic. Nobody left the stadium; they were all waiting for the big moment when the ‘little master’ would take centre-stage. Dhoni and Co. were the first to offer Sachin the guard of honour. They clapped, shook hands and hugged him, and followed him up to the dressing room. The presentation ceremony began, and so did the boos. Barring Mumbai Police Commissioner Satyapal Singh, the remaining line-up that included Mumbai Cricket Association's newly-elected president Sharad Pawar and Maharashtra Chief Minister Prithviraj Chavan were at the receiving end. Then the ‘master blaster’ stepped in and swept the crowd off their feet with his simple yet elegant parting speech. The overwhelming adoration of a nation was visible even when his team members proudly hoisted him on their shoulders during the victory lap. I stood there, in the stands, soaking in the moment. The enigma of the man I grew up watching, admiring, adoring and criticising was too overpowering. I am sorry I doubted you, Sachin. I now await your next innings.